Lob wedges have a loft of between 59 and 65 degrees and are designed to lift a golf ball quickly, then land it with lots of spin. The individual first taking up golf can become very confused by the different kinds of wedges and what these golf clubs are used for. This is because there are four different types of wedges, each with a different degree of loft, which is the key characteristic that separates one wedge from another. The degree of loft on a golf club influences the trajectory of the ball when the club strikes it correctly—the higher the degree of loft, the more quickly the golf ball goes into the air. Virtually every set of golf clubs come with a pitching wedge, which is a club with between 44 and 49 degrees of loft to the clubface. The pitching wedge is designed to be able to get under a golf ball on contact, and these clubs are used to hit shots from distances of between 110 and 125 yards. While a professional golfer may hit his pitching wedge some 25 yards further than that, both an amateur and a pro are looking to get the ball high into the air as they shoot it toward a putting green and land it near the hole. It is important for the new golfer to have an understanding of how far she can hit her pitching wedge with accuracy, as this will allow her to be able to choose and hit the other wedges when needed. The sand wedge was first made in 1930 for players to utilize to hit a golf ball out of the sand, but it has since been popularly employed to hit the ball from high grass or from a fairway. The loft on a sand wedge ranges between 54 and 58 degrees, and it has a heavy clubhead. Golfers will choose a sand wedge when facing a shot of between 80 and 100 yards that needs to get into the air quickly. The height a sand wedge can make a golf ball go when it is properly played translates into the ball usually stopping quickly after it descends onto the green. Some sets of golf clubs come with a sand wedge, while others do not. The lob wedge is a recent addition to the family of wedges. Golfers with experience will take a lob wedge when close to the green and try to hit it cleanly so that the ball flies into the air and then lands on the green with loads of spin. The degree of loft on a lob wedge is between 59 and 65 degrees, and the leading edge of the club is thinner; this makes this club the best choice, for example, when a hazard needs to be cleared. The golfer can take a full swing and still only hit a lob wedge between 60 and 70 yards, with the ball rising very rapidly and coming down onto the putting surface. Used from the high rough and from the fairway, the lob wedge does not come with a set of clubs and must be purchased separately. The best way to explain the purpose of a gap wedge and its differences from other wedges is to say that it covers the “gap” between the pitching and sand wedge. This means that it has a loft somewhere between 50 and 54 degrees, putting it in the middle of the pitching and sand wedges in terms of loft. The gap wedge is used to hit the ball between 90 and 110 yards, which fills the gap between the optimum distances for pitching and sand wedges. Rather than having to choose between swinging a pitching wedge easy or a sand wedge very hard to make the ball go these distances, a golfer can opt for the gap wedge, which can accomplish the task with a relaxed and full swing. 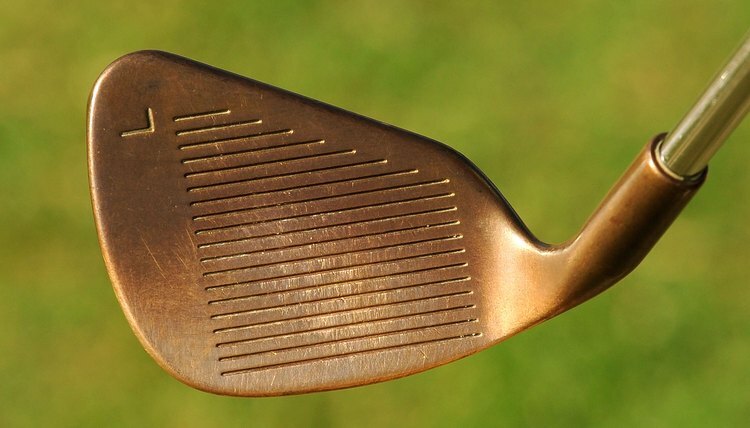 The rule of thumb is that a player should have four degrees of difference between wedges. For instance, a golfer with a pitching wedge lofted at 46 degrees should have a gap wedge of 50 degrees, a sand wedge at 54 degrees and a lob wedge of no less than 58 degrees.